There is a long tradition of Halloween productions in my family beginning with my dad's Percy the Pumpkin Man, continuing with my husband's many creations. 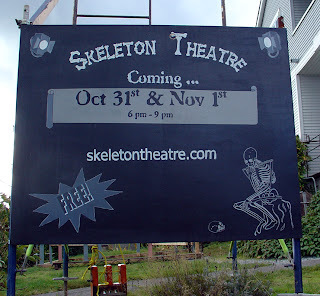 This year we're doing Skeleton Theatre again. It's a massive undertaking so I'll be busy with that for a little while, feeding lots of volunteers, making sure no one gets electrocuted and providing first-aid amidst all the kidling-related Halloween minutiae I've volunteered for. I'll be back to the blog once Halloween has passed and I've recovered from the excitement.